Fruitless Pursuits: Movies Worth Buying! Recently, I’ve actually been working on a project related to the massive amount of movies I own…the act of actually watching them. One of the bad habits I have is buying a movie that I want, even if I’ve never actually seen it, and then never actually getting around to watching the movie once I’ve bought it. Granted, many of the ones that I still need to watch are ones that I owned on DVD, and have replaced with a Blu-Ray…but still. I still have about a dozen to go before I can move on to the Star Wars/Star Trek Blu-Rays, and then I’m going to sit down and once and for all watch ALL of my MST3K DVDs. Like I said, I have a problem. And now I feel like I’ve killed enough space to warrant putting the actual list behind the jump. As always, there will be Amazon links with each listing, but that’s just because it’s easy and I’m lazy. You should always feel free to buy stuff anyplace you see fit. Ready? Then hit the jump and follow along! Yes, there’s other stuff out this week. 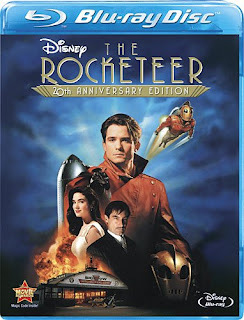 Yes, those other releases are maybe more “important” than a Blu-Ray release of The Rocketeer…but not to me. The Rocketeer is my all-time favorite comic book character, and this movie (while not perfect) really holds the spirit of the original Dave Stevens comics incredibly well. The downside to this is that even though it’s a “20th anniversary” edition, it’s not really treated as one. According to places like blu-ray.com, the transfer is far better than the one for the DVD, but it’s got virtually nothing in the way of extras. No commentary. No “behind the scenes”. No deleted or extended scenes. Not even a blooper reel. For me, this is inexcusable. This movie’s a classic, and deserves better treatment than this. But I’ll still be buying it…because I have a problem. Pity me. WHERE THE HELL DID THIS MOVIE COME FROM?! Okay, that may actually be a little too far into hyperbole even for me. The truth is I haven’t even seen it…yet. It came out in the middle of a summer packed with X-Men: First Class, Thor, CaptainAmerica, Green Lantern…well, you get the idea. There was a LOT of genre-type stuff out this past summer. Some of it was good, some really not so much. And that’s apparently the biggest surprise for me…apparently this was really good. I’m sure many people reading this have seen the old Charlton Heston Ape’s movies, and remember them fondly. I remember watching them with my dad when I was a kid, and thinking they were great! But the truth is that watching them now, they don’t really seem to hold up all that well. And then there was the remake from a few years ago…which we’re better off saying as little about as possible. But because of all that, I didn’t go see this in the theaters. I was happy holding onto my good memories, and saving my money for more comic book movies. Because apparently I was wrong. This is one that I really want to buy, but I may need to wait until after Christmas. It goes on a list with Super 8 and Cowboys and Aliens as “stuff I’m buying when I have extra cash". And now from a movie that I was one of the only people who didn’t see in a theater, to one seemingly NOBODY saw in the theater…I give you Fright Night. I was really looking forward to seeing this, and then it just came and went and I never even realized it was out until it was too late. This makes me very sad, especially since everybody who’s actually seen it seems to think it was really good. It’s even at 75% on Rotten Tomatoes, which for them is pretty fantastic. The original movie is a classic, and this movie has the added bonus of being stocked with: Ensign Chekov, Bullseye, McLovin’, Prince Humperdinck, and Doctor friggin’ Who. Lots of actors who have played roles important to geeks. And yet, where were we? This is where we make it up to them. It’s got great stars. It’s apparently really good. And now it’s out on DVD and Blu-Ray. Are you going to continue to ignore it? Don’t do that! Having said that, while I want to say I’m buying it this week, due to my yearly race to have Christmas put me in the poorhouse; it may just go on the “to purchase soon” list. We’ll see. This is early Peter Jackson. How much more do you need to know? It was the fourth movie that Jackson directed (the first three were BadTaste, Meet the Feebles, and Dead Alive), and honestly it was probably the first one that was widely seen. It was also pretty much the breakout role for Kate Winslet. It’s based on the true story of two girls who get a little too involved in their fantasy world, and things take a dark turn. That’s the short version. It’s a strange, but highly excellent movie that is very well written and equally well acted and again: it’s Peter Jackson. You’re missing out if you haven’t at least seen it. The Guild is one of those things that people either love or hate. There’s not really a whole lot of middle ground here. Just in case you wondered, I am on the side that loves it. Your mileage may vary, and that’s perfectly fine. We don’t have to agree on everything. I’m cool like that. However, even if you don’t like the show, or its creator/star Felicia Day, you’ve got to respect what they’ve been able to accomplish. They’re completely self-funded, though I count donations as “self-funding”, and have never been beholden to any kind of studio. It has carved a niche out for itself that was not possible before it came along. It is, for all intents and purposes, the granddaddy of the “web series”. Yes, there were probably a couple that came out before it. But can you remember one? Channel 101 made people realize that videos on the internet could find an audience, but the Guild went the next step and made an actual television show that only existed there. And its audience showed up in droves. The DVDs help keep the show going, and I find that a worthy cause. Plus, I like the show. Plus, I might be one of the annoying people that’s just a little bit in love with Felicia Day. Don’t tell. I’ve got a reputation to uphold. This is probably not exactly what you’re thinking it is. It’s actually a silent movie from 1922 starring John Barrymore as the detective. Kino seems to have a pretty decent track record with restoring old movies. They did some of the most recent and best versions of Fritz Lang’s Metropolis, and they’ve got a Buster Keaton release out this week that I left off the list but probably shouldn’t have. Barrymore was a fantastic actor, with a long and storied career…and yes, he’s Drew Barrymore’s grandfather. I don’t know much about the movie outside of this. Sorry. I don’t want to read the synopsis because I have fear of spoiled endings, and this is one of those things that goes on my “it would be nice to have” list, so I’d rather not do that. Honestly, I’m not sure why I put this on the list. The first movie was okay. I watched it with my sister’s kids once. Jack Black plays a panda. The new Pandas that are coming in the next WoW expansion are really making me want to pick the game back up. Yeah, that’s about it, there. It’s Family Guy. You’re either into it or you’re not. Personally, I think the show’s okay, but I don’t own any of it. So there’s that. This is the one on this week’s list (that isn’t Criterion) that I know the least about. When I say I don’t know much, I mean I’d never heard of it until last week. That was when it showed up in the ads for my comics. The name caught my attention, but I didn’t think much of it. Then I saw it on the list of new releases. The blurb on the cover says it’s “Crouching Tiger, Hidden Dragon meets Sherlock Holmes, only a lot more fun”. The Amazon blurbs call it “Kurasawa-esque”. It definitely has my attention now. Looking at some reviews of releases of the movie in other countries, it looks pretty fantastic. I’ll be honest, I actually thought this movie was a myth. I’ve heard about it, but I’ve never actually met anyone who’s seen it. It’s the only movie I’m aware of where Sam Raimi, director of such movies as Evil Dead and Spider-Man, has a starring role as an actor. The story is about employees in a supermarket being killed off in horrific ways. I hear the deaths are actually pretty great too. And of course it also has the required Bruce Campbell cameo. For those trying to place this in the timeline of Sam Raimi, this came out in 1989. Evil Dead 2 came out in 1987, and Army of Darkness came out in 1992. I look forward to seeing this one. Dammit…I need to hit the lottery or something. So apparently there are two more releases coming from Criterion this week. I had no idea…I thought it was just the ones from last week. The two from this week share a director: Seijun Suzuki. I don’t really know much about either film; Tokyo Drifter is labeled as a “jazzy gangster film”, and Branded to Kill is about a hitman who screws up and ends up a target. You now know as much as I do. People seem to hold the director in pretty high esteem, and admittedly, they sound interesting…but I think I’m okay passing on these two. So that's it for this week. Thanks for reading, and maybe I'll be back again next week! Rise of the Planet of the Apes is a good one. Andy Serkis really brought the heart to this film with his stellar mocap acting. I was floored by how awesome the apes were. and finally YESSSSSS Rocketeer! but yeah total BS with Disney(?) on not putting any extras with it. Don't tell me things like that! I'm purposely downplaying how cool they sound because then I'll want to buy them...I'm not made of money!! I was pleasantly surprised by Planet of the Apes. Not a big fan of the franchise, although I liked the original movies as a kid, but this new movie rocked! Mario Kart 7 - Two Sentence Review! G.I. Joe Retaliation Trailer Premiere!